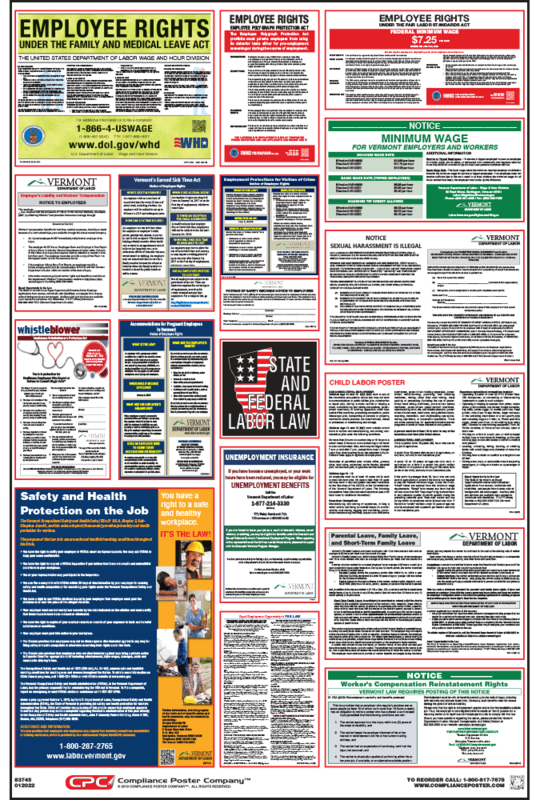 Federal and Vermont laws require employers to post notices informing employees of their rights and protections while performing work for their employers. The Vermont Labor Law Posters contain each of the state and federal mandatory labor law notices that must be posted in the workplace. Vermont employers may also be required to post separate posters depending on their industry. HB 552 (6/2015) Minimum Wage: Beginning January 1, 2019, the minimum wage rate is annually adjusted for inflation based on the Consumer Price Index. HB 707 (7/2018) Sexual Harassment: Effective September 15, 2018, employers are required to post the updated Sexual Harassment notice expanding sexual harassment protection to all workers, not just employees. HB 711 (7/2018): Employers are required to provide crime victims with job-protected, unpaid leave to attend certain legal proceedings relating to the crime, effective July 1, 2018. HB 136 (2018): Vermont employers are required to provide reasonable accommodations for pregnant employees and are required to post a notice of pregnant employees’ rights in the workplace, effective January 1, 2018.